Charles Moore, the former editor of The Daily Telegraph, whose authorised biography of Margaret Thatcher is published this week , is to give a talk on the future of Christianity in Britain at an event in London being organised by the Friends of the Ordinariate. Moore, a former Anglican who converted to Catholicism in 1994, is an honorary Vice- President of the Friends which was set up to support the Personal Ordinariate of Our Lady of Walsingham – the structure established by Pope Benedict to allow Anglicans to enter into the full communion of the Catholic Church whilst retaining much of their Anglican heritage. At the invitation of the Provost and the Fathers of the Oratory, the event will take place in the Little Oratory, Brompton Road, London on Thursday June 13. It will begin at 6pm with Evensong and Benediction with the Ordinary, Monsignor Keith Newton, presiding. Music from both the Anglican and Catholic traditions will be provided by the well-known Oratory choir. 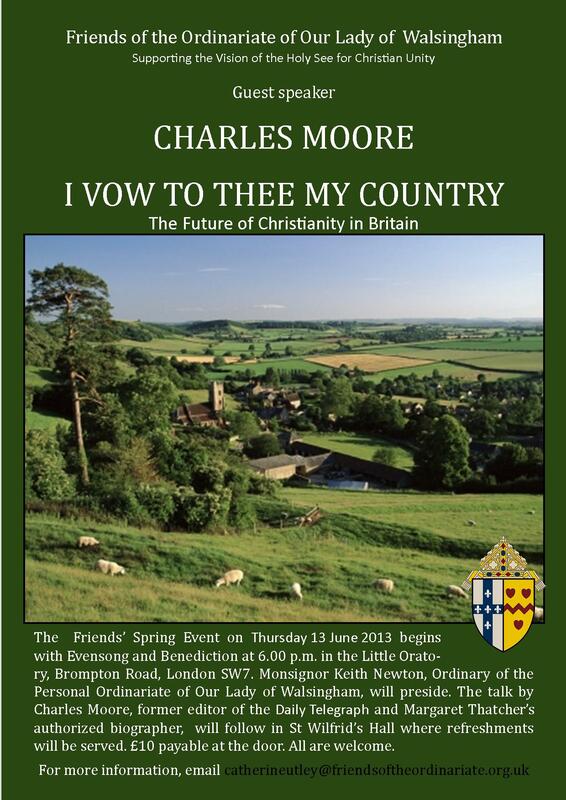 Charles Moore’s talk will follow in St Wilfrid’s Hall next to the Little Oratory. Moore is one of Britain’s most respected journalists. He writes three columns a week: two for the Daily Telegraph, one for The Spectator magazine. For the last sixteen years he has also been writing the authorised version of Margaret Thatcher’s biography. The first volume is published on Tuesday; he is now engaged on the second volume. As well as raising much needed funds for the Ordinariate, the Friends’ main aim is to help integrate it more fully into the hearts and minds of all Catholics.